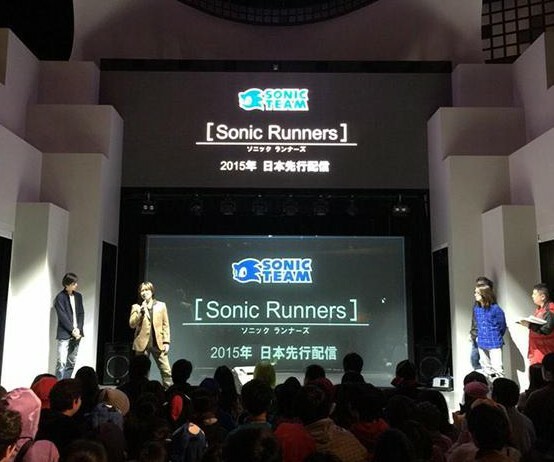 The rumoured game Sonic Runners has been officially announced by Takashi Iizuka. The game is being developped by Sonic Team and is set for a release somewhere 2015. And yes, the rumours were true. Sonic Runners will be, yet again, a Smartphone game. It is yet unknown if it will be available on both Android and Apple systems. Nothing else is known so far, but it's expected Sonic Team will release more information in January. Whenever more information is available, we'll update the news, so stay tuned! Jan. 5, 2015, 7:56 a.m. I wonder if it will be just some other boring game like sonic dash…. They better get MS in it. Jan. 17, 2015, 9:53 p.m.
OMG another smartphone game?! are they just TRYING to destroy the sonic francise?! Feb. 13, 2015, 8:34 p.m.
Yeah, I'll download it if it's free. I just can't wait until his 25th anniversary game. April 5, 2015, 4:22 p.m. Anyone else really frustrated with how they are handling the franchise? June 19, 2015, 8:25 p.m.
July 30, 2015, 3:58 p.m.
Sept. 7, 2015, 6:51 a.m. The game cought my atention and so far i know that it is available in google play!!! Edited: Sept. 7, 2015, 6:52 a.m.